An aspiring young vet from Swinton Primary School with a Galedin vet. The fourth Border Union Agricultural Society Children’s Countryside Day will be held at the Border Union’s Showground in Kelso on Tuesday, May 17. This annual event is for all Primary 5, 10-year-old children in the Scottish Borders region. More than 1,200 pupils from 60 schools will visit the Border Union Showground for this special event when there will be over 50 different exhibits and demoinstrations of all that is agricultural, rural and environmental. The children will see and learn where their food comes from and how it is produced, and all aspects of development of the land and its history. They will learn the importance of trees and rivers, get the chance to see beneath the water and view the exhibition of creepy crawlies specially caught for this event. There will also be live sheep shearing, interactive dough work with the Borders College, an explanation of the Countryside Code and health and safety in the countryside, as well as a live display of animals and all types of farm machinery for the children and teachers to see. 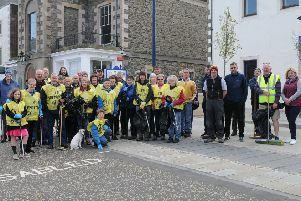 Over 100 volunteer stewards will look after the children during the day, including volunteers from Borders Rotary Clubs and the Royal Bank of Scotland. This day would not happen without support and BUAS are delighted that EDF/Roxburghe Estates have awarded the society a major contribution towards the event’s expenses for the next three years through their Fallago Environment Fund.